What happens when a major international airline takes delivery of a brand new aircraft and is taking every opportunity to further their marketing? Well they might overlook simple marketing tools such as renewing their domain name! This week Emirates (طيران الإمارات) has taken delivery of its first Airbus A380 and been using every marketing tool available to them to attract attention to the launch of their Airbus A380 service between Dubai (DXB) and New York (JFK). During this media-blitz week their website suddenly went dead. It turns out that Emirates’ IT department overlooked the little detail of renewing their domain name. 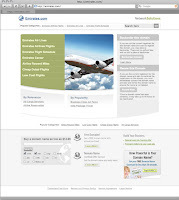 As potential travelers logged onto the website they met a generic placeholder site rather than the airline’s site. As you read this you should probably consider logging into your domain host account and checking your domain name expiration dates. Below is a photo of both the Emirates web site front page and the generic ‘place holder’ page that was found at Emirates.com when it went off line.